It's pre-order time! 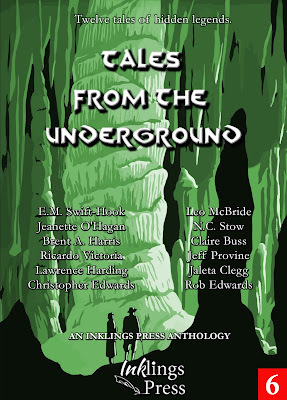 The new anthology from Inklings Press - Tales From The Underground - is out this Friday, October 6, and is available on Amazon now. The Inklings Press crew stops by below to explain why Tales From The Underground was the next step in the series of anthologies. It includes one of my stories, Professor Algernon Whitlock's Exotic and Fabulous Grand Tour of the Underground. We have a challenge for you. Put your feet on the ground. Feel the earth under your feet. Now imagine… imagine what is under that earth. Imagine the Underground. Tales From The Underground is a new collection of stories from Inklings Press – with a dozen stories from writers around the world, all imagining what might lie beneath the ground. There are stories of fantasy, there are stories of science fiction, there are stories bringing you a shiver in the dark. Inklings Press started out as a collective of writers working together to publish short stories – and though the net is wider these days, that’s exactly what Inklings Press remains. Royalties are evenly divided between writers, so every book sold gives contributors more money in their pocket. The press takes a single share too, the same size as any writer’s, to pay for advertising and promoting the book. In short, Inklings aims to provide a place for writers who are new or up-and-coming, and we’re delighted to bring those writers’ stories to the world. Why Tales From The Underground? Tales From The Underground is perhaps the most natural development in the Inklings collection of books so far. The idea came from the writers of previous anthologies. In discussion, the writers themselves suggested the theme, so we ran with it. And the outcome is the biggest collection of stories yet from Inklings Press. Who is in the anthology? There are writers from around the world in the collection – there are stories that were authored in Australia, made in Mexico, that flourished in Finland and France, emerged from England and were born in The Bahamas. The list of authors includes those with novels to their name, and those who are still taking their first steps in publication. The authors in the anthology are Jeff Provine, Brent A. Harris, E.M. Swift-Hook, Claire Buss, Ricardo Victoria, Christopher Edwards, Lawrence Harding, N.C. Stow, Rob Edwards, Jaleta Clegg, Jeanette O’Hagan and Leo McBride. You would love this anthology if you loved…? One of the nice things about this collection is the range of stories inside. Fantasy is a strong theme throughout, as in the urban fantasy of Rob Edwards’ The Lords of Negative Space, about the world just out of sight. But there are also science fiction tales, such as Jaleta Clegg’s tale, The Angels of Mestora, in which unwary dwellers of a distant planet are lured away from civilization by “angelsong”, and Ricardo Victoria’s Buried Sins, with a battle in an ancient underground city. Jeff Provine delves into a cavern with a reputation for weird events, while Brent A. Harris takes us on a trip through time. N.C. Stow imbues her tale with the influence of Russian mythology, while both Lawrence Harding and E.M. Swift-Hook tell us tales of mythology in worlds of their own devising. Claire Buss goes underground in more than one sense in her tale Underground Scratching, and Jeanette O’Hagan presents a team of miners fighting for their very lives against supernatural powers. Christopher Edwards tells us a tale of strange visions in an RAF bunker, and Leo McBride follows explorers retracing the steps of an expedition that never returned. There are ghosts, there are distant planets, there are things happening in the ground under our very feet. Legends are revealed, and legends are made. It is a delight to watch the stories take such different directions while all sharing the same theme. Tales From The Underground is available on Amazon at mybook.to/Uground. You can also learn more at www.inklingspress.com. Each story also includes information about the writers, so if you fall in love with one of the works, you can follow the links to learn – and read – more. So take a peek, and come join us, down here… in the dark.